After single-handedly consuming almost a whole batch of potato, leek & artichoke soup last week, I thought I had soup out of my system for a while. That was, until yesterday at breakfast. 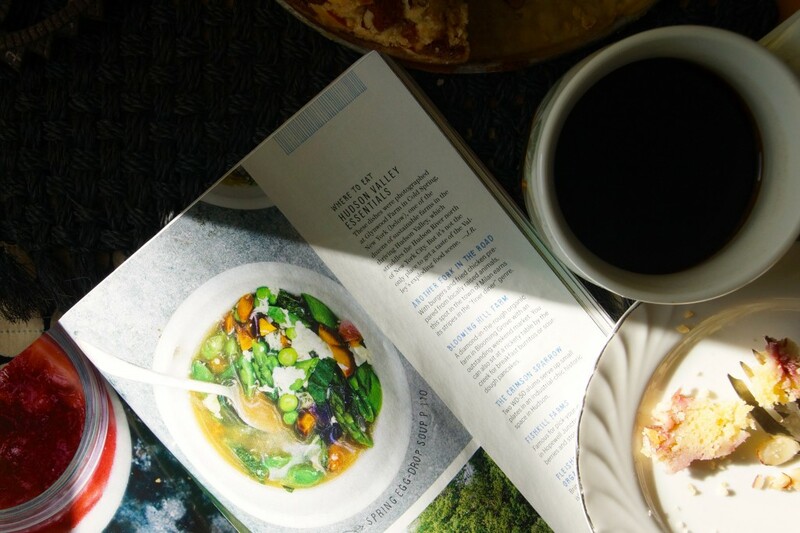 As I flipped through the latest issue of bon appétit, I kept landing on the same few pages–a gorgeous spread of recipes featuring fresh spring produce and daydream-inducing photos of lush green farmland. Of all the recipes in the article, it was the simple bowl of spring egg drop soup that really caught my eye. It looked so lovely, charmingly green and everything spring has to offer spooned into one bowl. Seems I hadn’t quite had my fill of soup after all. Shopping for this soup is easy, just grab every spring-y green item the produce department has to offer: asparagus, peas, leeks, fresh herbs. To my surprise, my grocery store had ramps. Ramps! If you’re unfamiliar, ramps are a wild onion with a slightly garlicky bite. They are adored by restaurant chefs, the world over, but are sometimes difficult for home cooks to get their hands on. If you can’t find them, just ramp up (pun very much intended) the garlic and add some spinach or sorrel in place of the ramp greens. Prepping the veggies takes a little time, but it’s the sort of task I find soothing. Cut the root ends off the ramps, chop the bulbs and stalks, roughly chop the leaves. Slice the leeks into rings and soak in water ’til the grit is gone. Asparagus gets sliced on the diagonal. Snap the ends off the peas, then cut the pods in half. Chunk up a few carrots even though they interrupt our color scheme. Slice garlic. Rinse herbs. Once everything is washed, chopped, and ready, the soup will go together in minutes. Start the soup by sautéing the leeks, carrot, garlic, and chopped ramps in olive oil. In 5 minutes, the leeks will start to wilt and you’ll be smelling garlic. Go ahead and add chicken or vegetable stock. I’ll spare you the lecture, but your soup will taste way better in the end if you use homemade stock. Just sayin’. Let the soup simmer for 10 minutes, until the vegetables soften. Add the peas and asparagus and simmer for just a couple of minutes until they are just tender on the outside with a bit of bite still in the middle. Meanwhile, poach a couple of eggs. I know, I know, the pretty picture in the magazine was of egg drop soup. That’s all well and good if you plan to eat the whole batch of soup in one sitting, but the mental image of leftover egg drop soup is less than picture-perfect and big batches of soup tend to hang around for a few days, so I chose to float a poached egg in my soup bowl instead. You may remember, I used to think poaching eggs was difficult. It’s not! Bring a saucepan of water to a simmer with a splash of vinegar and a pinch of salt. Crack eggs into teacups and gently lower them into the water. Kill the heat, cover, and set the timer for 4 minutes. Toss the ramp greens into the pot to wilt, stir in torn mint leaves and tarragon, and finish with a squeeze of lemon and a few twists of black pepper. Place a poached egg in the center of a soup bowl and ladle the soup around it. Celebrate all things green. This soup is best served the day it's made. 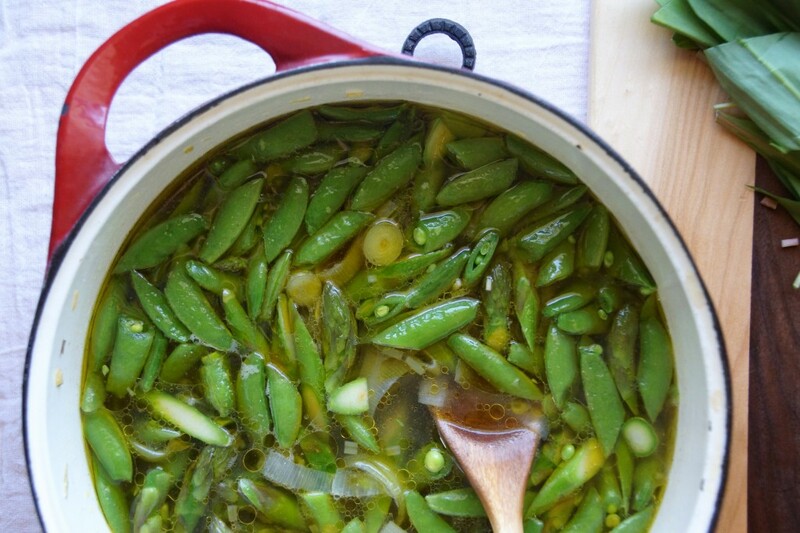 The asparagus and peas lose their vibrant color and the fresh herbs lose some of their punch after being refrigerated. Heat olive oil in a heavy-bottomed soup pot. Add leeks, carrots, the diced ramp stalks, and garlic. Season with salt and sauté over medium-high heat until the leeks soften and the garlic starts to turn golden, about 5 minutes. Add the stock and bring to a boil, then reduce to a simmer. Simmer until the vegetables are tender, about 10 minutes. Add the asparagus and pea pods and continue to simmer until the asparagus and peas are crisp-tender, about 3 minutes. Meanwhile, bring a large, lidded skillet of water to a simmer. Add a splash of vinegar and a pinch of salt. Crack each egg into a teacup and gently lower into the simmering water. Turn the heat off, cover the skillet, and let the eggs poach for 4 minutes. Remove the eggs and place 1 in the bottom of each soup bowl. To finish the soup, remove from heat and stir in the chopped ramp leaves and fresh herbs. Taste and season as needed with salt, black pepper, and fresh lemon juice. 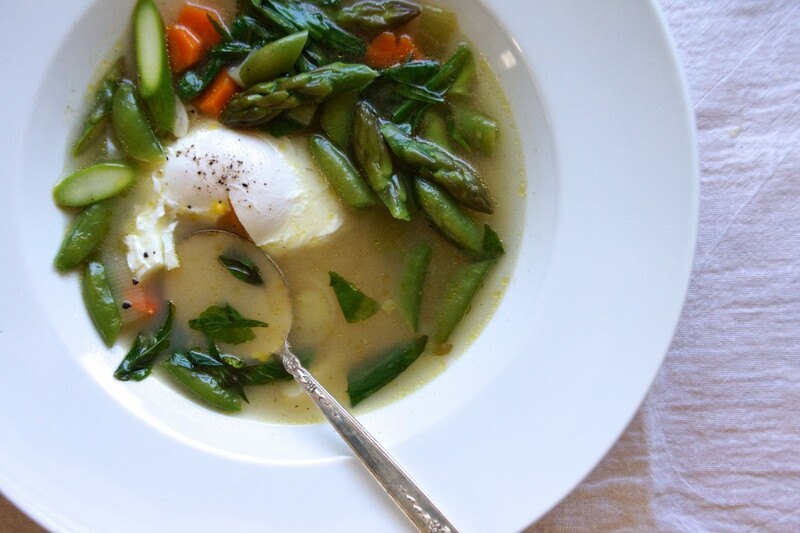 Ladle the soup around the poached eggs and serve immediately. 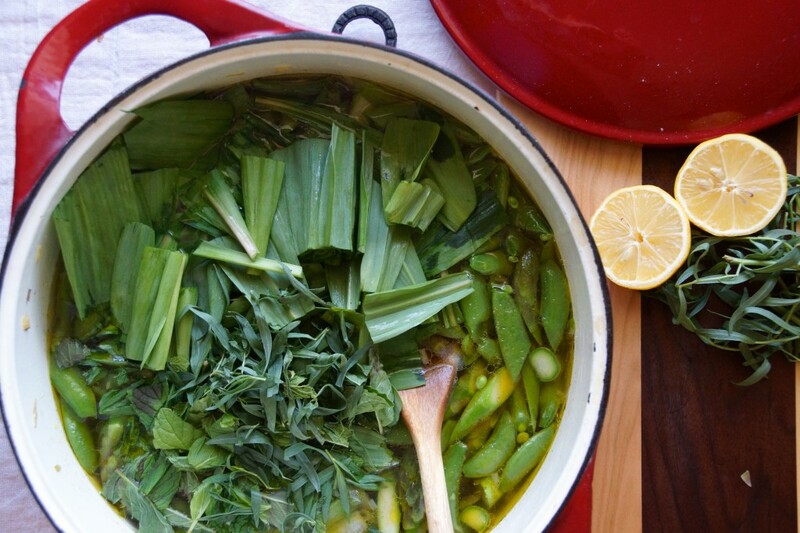 Ramps are not always the easiest ingredient to source. If you can't find them at your farmer's market or grocery store, you could go on a foraging adventure...or just add a couple more cloves of garlic and a few handfuls of spinach or sorrel at the end. Looks delicious and since it is going to be cold and snowy one (?!) more time, soup with a spring theme sounds perfect! 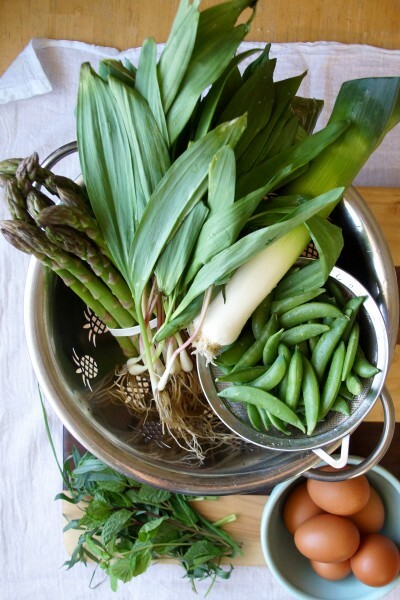 I love spring and all the awesome ingredients that come with it. 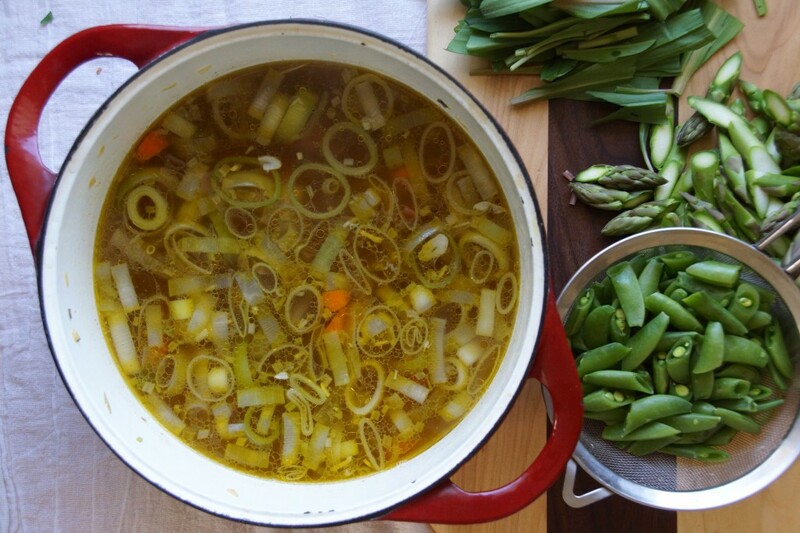 This soup looks wonderful and is right up my alley. 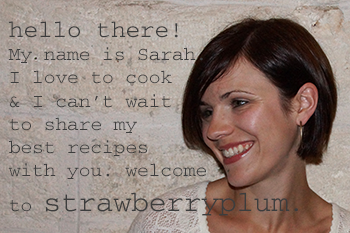 Love the poached egg in it too! They are much easier to make than people think.